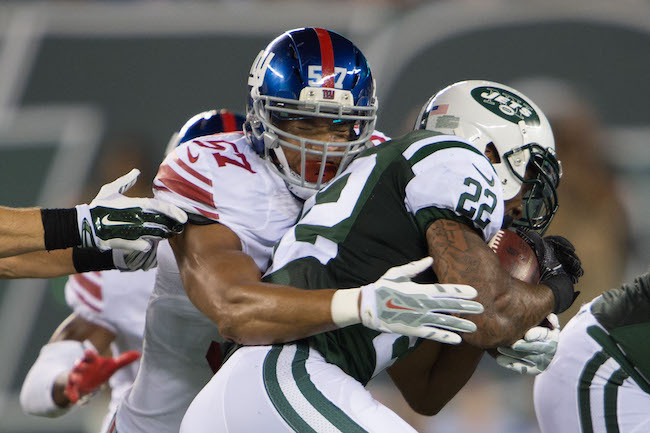 The New York Giants placed linebacker Keenan Robinson on Injured Reserve on Tuesday. Robinson suffered a quad injury in the game against the Los Angeles Rams on October 5th. The Giants also waived wide receiver/returner Ed Eagan and defensive end Devin Taylor. 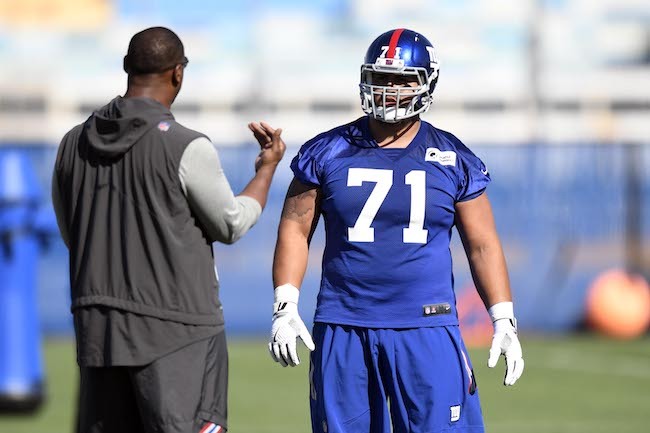 To fill those three roster vacancies, the Giants signed free agents offensive guard John Greco and linebacker Akeem Ayers, and promoted wide receiver/returner Kalif Raymond from the Practice Squad. The Giants signed tight end Matt LaCosse and Nick Becton to the Practice Squad. The injury-prone Robinson played in six games this season with three starts and had 32 tackles. He missed the season’s first two games with a concussion. Eagan was signed to the Practice Squad in September and the 53-man roster in October. The 5’11’, 183-pound Eagan was originally signed by the Dallas Cowboys as an undrafted rookie free agent after the 2016 NFL Draft. He has spent time with the Cowboys, Cleveland Browns, and Buffalo Bills. The Giants signed Eagan in August 2017. The Giants signed Taylor in late October 2017. He had signed with the team in May 2017 but was cut in early September. Taylor was originally drafted in the 4th round of the 2013 NFL Draft by the Detroit Lions. The 32-year old, 6’4”, 318-pound Greco was originally drafted in the 3rd round of the 2008 NFL Draft by the St. Louis Rams. He has spent time with the Rams (2008-2010), Cleveland Browns (2011-2016), and New Orleans Saints (2017). Greco has started 70 of the 111 regular-season games he has played in, including starts at right guard (45), left guard (24), and center (1). The 28-year old, 6’3”, 247-pound Ayers was originally drafted in the 2nd round of the 2011 NFL Draft by the Tennessee Titans. He has spent time with the Titans (2011-2014), New England Patriots (2014), St. Louis Rams (2015), and Indianapolis Colts (2016). Ayers has started 57 of the 91 regular-season games he has played in, with 15.5 sacks, four interceptions, and four forced fumbles. Raymond was signed to the Practice Squad in October 2017. The 5’9”, 160-pound Raymond was originally signed by the Denver Broncos after the 2016 NFL Draft. He has spent time with both the Broncos (2016) and New York Jets (2017). Raymond has played in six NFL games. The diminutive Raymond has not caught a pass, but he has returned nine kickoffs (24.7 yards per return) and 16 punts (9.3 yards per return). LaCosse played in three games this season for the Giants with one start. The team waived him on Saturday to make room for fullback Shane Smith. LaCosse was originally signed by the Giants as an undrafted rookie free agent after the 2015 NFL Draft. The Giants waived/injured him in August with a hamstring injury and re-signed him to the Practice Squad in November and the 53-man roster in December 2015. He played in two games in 2015 and finished with three catches for 22 yards. The Giants waived/injured Matt LaCosse in late August 2016 and then placed him on Injured Reserve with a knee injury that required surgery. LaCosse is a versatile player who played tight end, H-Back, and fullback in college. LaCosse has good speed and catches the football well. The 6’6”, 322-pound Becton was originally signed as an undrafted rookie free agent after the 2013 NFL Draft by the San Diego Chargers. He has spent time with the Chargers (2013), Giants (2014), New Orleans Saints (2014), Chicago Bears (2015-2016), Detroit Lions (2017), and Kansas City Chiefs (2017). Becton has played in six regular-season games with no starts. The Giants have allowed a receiving touchdown to an opposing tight end in 10 consecutive games dating back to last year. According to the Elias Sports Bureau, that is the longest such streak in NFL history. In their last two games, the Giants gave up touchdown passes of 52 and 67 yards to the Rams, and 47 and 83 yards to the 49ers. It is the first time in their history they allowed two touchdown passes of at least 47 yards in back-to-back games. This season, the Giants have held just one opponent to less than 100 rushing yards; Denver ran for 46 yards on October 15. Not coincidentally, that was the Giants’ lone victory. Giants Claim CB Chykie Brown Off of Waivers: The New York Giants claimed cornerback Chykie Brown off of waivers from the Baltimore Ravens on Wednesday. 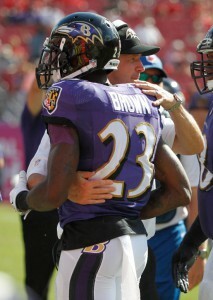 Brown was originally drafted by the Ravens in the 5th round of the 2011 NFL Draft. In four seasons with the Ravens, Brown played in 46 regular-season games with two starts. He has decent size and athletic ability but he struggled in Baltimore. The Giants also officially placed CB Prince Amukamara on season-ending Injured Reserve. 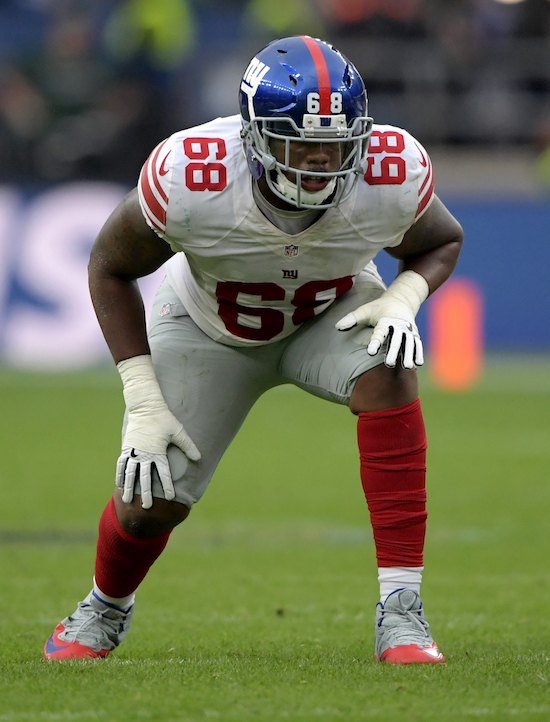 Practice Squad Moves: The New Orleans Saints signed offensive tackle Nick Becton off of the Giants’ Practice Squad. To fill that vacancy, the Giants signed safety Kyle Sebetic to the Practice Squad. 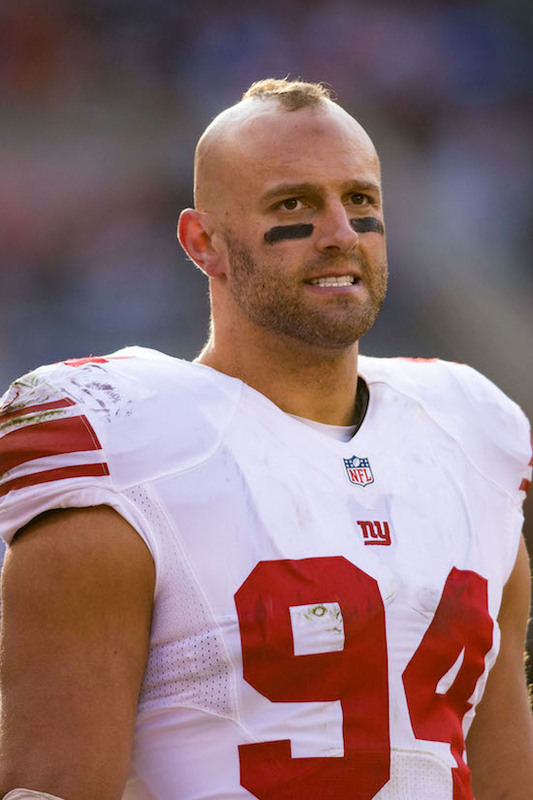 Sebetic was originally signed by the Giants as an undrafted rookie free agent after the 2014 NFL Draft. The Giants waived him on August 26. November 5, 2014 New York Giants Injury Report: RB Rashad Jennings (knee), OG Weston Richburg (ankle), DE Mathias Kiwanuka (knee), and P Steve Weatherford (ankle/back) did not practice on Wednesday. CB Dominique Rodgers-Cromartie (back/hamstring) and DT Cullen Jenkins (calf) practiced on a limited basis. November 5, 2014 Tom Coughlin Press Conference: The transcript of Head Coach Tom Coughlin’s Wednesday’s conference call is available at Giants.com. QB Eli Manning on WFAN: The audio of Tuesday’s WFAN interview with QB Eli Manning is available at CBS New York. Notes: The Giants are the only team in the NFL that has had every one of its games this season decided by more than seven points. The final margin in their three victories was 13, 31, and 10 points. The difference in their five defeats was 21, 11, 27, 10,and 16 points. officially signed on the practice squad w/ the New York Giants! beyond thankful for this amazing opportunity! All except Becton were waived by the Giants on Saturday. Becton was originally signed as an undrafted rookie free agent after the 2013 NFL Draft by the San Diego Chargers. Becton spent time on both the Chargers’ 53-man roster and Practice Squad last season, only appearing in one game. Becton has a nice combination of size (6’6”, 323 pounds), long arms, and athleticism. 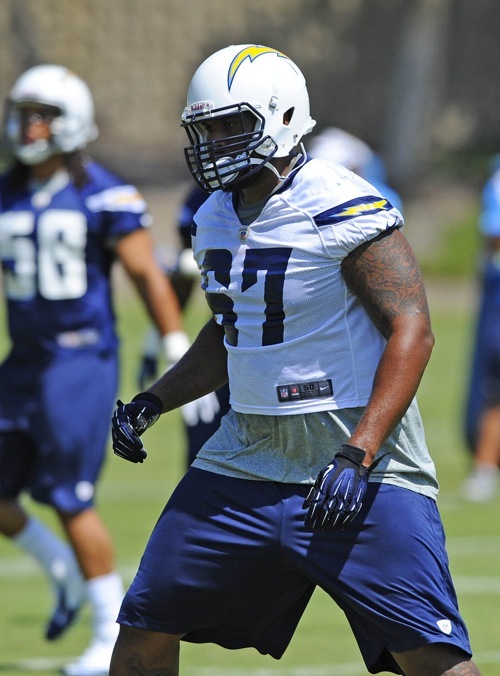 In addition, the New England Patriots claimed DT Kelcy Quarles off of waivers. Quarles is a player who the Giants most likely wanted to sign to the Practice Squad.